When I was little, I had a thing for chocolate-covered cherries. I’m not really sure how it started–no one in my family likes chocolate cherries, so I don’t know where I first had them. But man, did I love them. While my brothers would get Sour Patch Kids or Razzles (remember Razzles?!) from the candy store, I’d go to the fancypants chocolate counter and get two or three chocolate cherries. Now that I’m older, I can’t stand those chocolate cherry cordials. They are waaaay too sweet for my tastes. But I still love that combination of chocolate and cherries–just not all the added sugar. Since I’m on a bit of a muffin kick lately, I thought I’d try making chocolate cherry muffins. I’ve had half a bag of dried cherries sitting in the pantry since October, so it was time to use them up! And I had all of the other ingredients on hand too, so these muffins were just meant to be. Unfortunately, I’m still learning when it comes to baking, and I burnt them. They weren’t so burnt that they were inedible, but they did end up being a little bit dry, especially on the bottom. I’ve adjusted the time in this recipe so if you make them, I don’t think they’ll burn for you–I had mine in the oven for 20 minutes. Other than the whole burnt bottom thing, these muffins were tasty. With the chocolate and cherries, they taste decadent, but they’re still healthy. Okay, maybe not healthy–healthier. Healthier than a typical muffin and certainly healthier than those sugary chocolate cherry cordials I loved in my younger days. These chocolate cherry muffins taste decadent, but with Greek yogurt, dried fruit, and whole wheat flour, they’re good for you too. Preheat oven to 400 degrees. 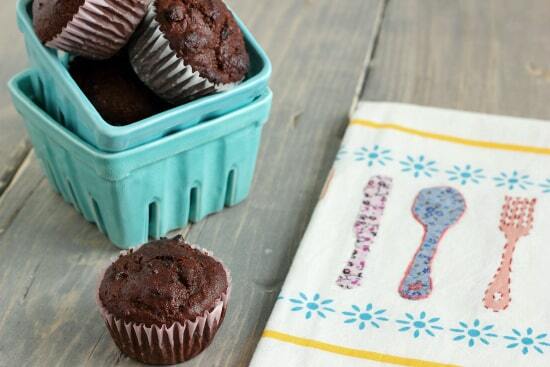 Spray muffin pan with cooking spray or fill with paper liners. Combine flour, baking powder, baking soda, and cocoa powder in a large bowl, whisking until lumps are gone. In a medium bowl, combine sugar, yogurt, canola oil, and egg. Add wet mixture to flour mixture and stir until moistened. Fold in cherries and chocolate chips. Divide mixture evenly into muffin cups. Bake for 15-17 minutes or until toothpick inserted into the center of a muffin comes out clean. What I Ate This Week | Burgers (again). Garden Update | Mold in my Seed Starting Flats. Sob! The Mr will love this recipe! Yummy! I love muffins 🙂 Thanks for sharing, I’ll give this recipe a try. I still love those chocolate covered cherries! They are so sweet, they literally make my teeth hurt! I think this is a sign that I’m getting old. I never liked those chocolate cherries,but these I would love! And yes, I remember Razzles! Yay, someone remembers Razzles! First they’re like candy, then they’re like gum! I am not a fan of chocolate and cherries together but I bet my husband would love this. Thanks for sharing. Well, you can always leave the cocoa out–I’ve actually done this recipe without the cocoa and it turned out fine! This looks delicious! I love the combination of chocolate and cherries. Thank you! Oddly enough, the tops were really moist–just the bottoms got dried out and a little blackened. Hard to believe that something so good and yummy can be good for you too! Once again you have created an awesome recipe! Thanks and keep it up. I never used to like cherries in my desserts, I would always pick them out! But I just recently started using dried cherries in baking, and I love them – dried cherries and chocolate is an amazing combination! I like REAL cherries (and maraschino cherries–shh, don’t tell), but I hate the canned pie filling type cherries–I pick those out too. Dried cherries are so much better! All the pictures look so amazing. I have been drooling over your blog today and these muffins look fantastic! I’ve made chocolate chip cherry cookies too! So we definitely do share the same sweet tooth. 😉 Now I find I much prefer tart cherries than the sickeningly sweet kind. Made these and they are delicious – and my kids are them! Do you have nutritional info for them? I’m glad you enjoyed them! I’m sorry, I don’t calculate calories for my recipes.